When I was a kid, I remember how excited my parents were when they received news they were eligible to become the proud owners of a brand new, 16-foot sailboat. It was a free boat giveaway — with one hitch. They had to buy a timeshare in the undeveloped swamplands of Central Florida to become captains of the vessel. We were all disappointed when we realized we weren’t getting the free boat. It was a hard-learned life lesson to read the fine print. But, when it comes to hosted blogging sites, there really are loads of free options to get your ideas out there without having to worry about ponying up cash for the online real estate. Here, we’ll take a look at some of the best. 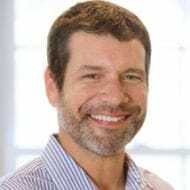 In 1994, Justin Hall created what would become known as the world’s first blog, Links.net, which chronicled his life in detail. And, by 2004, the aptly named Blog would be honored with Merriam-Webster’s Word of the Year award. Since the early days of the internet, blogging caught on as a way for individuals to express their passions and for businesses to communicate to consumer bases. By 2011, there were upward of 173 million blogs blasting information to audiences globally. And the J-shaped curve of exponential blogging growth has continued its upward trajectory, with Tumblr alone containing more than 350 million blogs on its platform. Today, there are a number of tools to help people transmit ideas online, and many of them are free. Let’s take a look at the top blog hosting sites you can leverage at no charge. If you’re looking to build a professional-looking, beautifully crafted website on which to launch your blog at no cost, Wix tops our list. More than 100 million people employ the platform to create and host sites for a number of uses, including business, eCommerce, and — for our purposes here — building blogs. Wix offers an intuitive drag-and-drop web builder and designer-created templates that allow sites to be up and running in a matter of moments. Bloggers taking advantage of Wix’s free plan enjoy access to the platform’s huge collection of stock art to illustrate their sites. And Wix’s templates are all mobile responsive, so your site will be presented in its best light no matter the device on which it’s being viewed. If you haven’t heard of WordPress, you’re either very new to the web development game or have been blogging from underneath a rock on Mars. The most popular CMS on this planet, WordPress powers more than 25% of sites on the web. WordPress offers free open-source software millions of bloggers employ to develop stunning websites to house their content. Whether it’s a text-centric theme that brings your words front and center or a graphically charged photo blog that showcases your portfolio, WordPress’s designs can make your vision a reality. There are more than 45,000 plugins built for WordPress that allow site owners to customize sites to their exact specifications. All of the platform’s designs are responsive and come complete with built-in SEO. After using the free software to develop your blog, consider moving to the value-added hosting packages many hosts offer for next to nothing. A free site from Wix also includes a Wix.com subdomain, 500MB of storage, up to 500MB of bandwidth, and unlimited access to support tutorials. In addition, the platform offers an app market with hundreds of plugins to enhance your blog and customize it to fit your brand. A web building platform with a funny name, Weebly’s free hosting package is a great starting place for the blossoming blogger on a mission to push a point of view. Weebly offers an easy-to-use, drag-and-drop editor so site owners without any coding knowledge can build compelling, eye-catching blogs. With the platform’s free tier, users are given 500MB of storage and a Weebly.com subdomain. Weebly also provides its site owners with search engine optimization and lead capture functionalities at no additional cost. As an added bonus, bloggers hosting sites on Weebly benefit from a community forum to discuss blogging best practices and chat and email support if they run into any issues. For site owners looking for a richer feature set, the perks go up for just a few dollars per month. Weebly’s paid plans offer advanced analytics, eCommerce tools, and an array of solutions to help market your brand. The three zeros in the name say it all — 000webhost provides top tier web hosting for $0.00. Bloggers hosting sites with 000webhost are guaranteed no ads, no hidden costs, and a feature-heavy package. If you’re looking for a ton of features with a $0 price point, 000webhost might be the hosting provider for you. The host offers hundreds of high-quality templates site owners can use as a foundation to build their sites. With a simple point-and-click web builder, bloggers can create a homepage, photo galleries, and various subpages on which to add content. The most popular features 000webhost offers are its 99% uptime guarantee and nearly limitless disk space and bandwidth. This ensures bloggers can house video and audio media without running up against storage concerns and handle more traffic as their sites grow. At the time of writing this guide, x10hosting had transferred 72,284 GB or data, served 12,116,853 webpages, and hosted 122,571,223 files. If this seems like a lot, you’re right. It’s numbers like these that make x10hosting one of the top free blog hosting sites on the web. Free host x10hosting offers 150 customizable and stunning templates to give your blog a professional feel. Using top-of-the-line, enterprise-grade server infrastructure, x10hosting offers bloggers super high availability, fast load times, and unmetered bandwidth and disk space. This allows your readers full visibility of your site any time, and, with no limits on traffic, gives you the ability to grow your audience quickly. Bloggers hosting with x10hosting have access to the immensely popular and effective control panel cPanel so they can easily manage their sites. FTP, email, and MySQL are also included in its feature set, as well as a website builder to quickly design and broadcast your ideas. Creative expression is an important part of what makes us human. It also carries with it health benefits that increase brain function, relieve stress, nurture a rich social life, and even prevent ailments like Alzheimer’s disease. 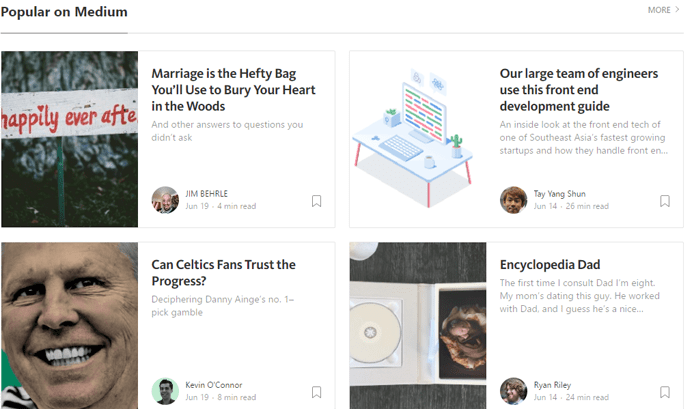 Medium’s blogging platform puts writers’ messages front and center to attract the widest possible audiences. Medium’s free blogging platform offers an ideal venue for creatives to express themselves and blast their work to the masses. Thousands of users publish their thoughts on Medium with stories ranging from current events and news to quirky personal stories and politics. Medium’s content management system makes it simple for bloggers to add their words and illustrate them with photos, audio, and video. The free-to-get-started, membership-based site provides an interactive experience where readers can leave comments and highlight the content they’ve most enjoyed. Medium’s homepage also highlights popular blogs, handpicked articles from its staff, and presents the best blogs in categories, including technology, entrepreneurship, politics, and culture, among others. 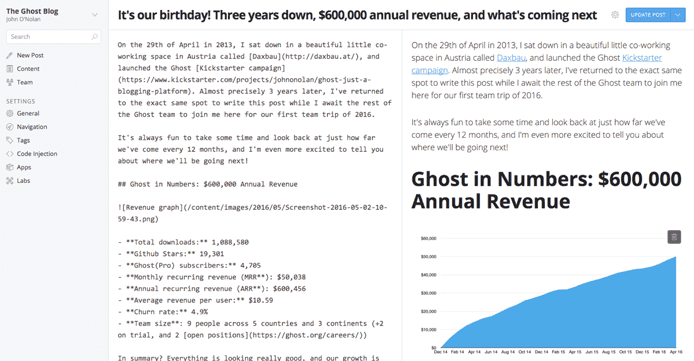 Ghost provides open-source blog creation software that was built to specifically zero in on the needs of journalists and writers. The free software has been downloaded by more than 1.4 million people around the world to build custom sites with a focus on the written word. Ghost offers free, open-source site creation software bloggers can employ to build their online presence. Developers who download Ghost have full access to everything the open-source software provides to build a site, including APIs and strong templates that make it simple to develop a blog’s foundation. Ghost’s setup guide makes it easy to install and run the software, and developers are invited to give back and contribute to Ghost’s open-source tools. While Ghost’s software is available for free download, the organization does offer fully managed plans at a premium. The paid plans come with a suite of publishing tools to make content entry a breeze; however, these packages come with large price tags, so bloggers may be better off downloading the software and seeking a better hosting package with a more cost-effective host. Built in 1999, Blogger is one of the oldest blogging platforms on the market. Blogger sites are easily recognizable with the popular blogspot.com subdomain the platform provides its users for free on the web. No matter the subject you undertake, Blogger offers compelling templates that are compatible with your brand. The layouts are flexible and offer hundreds of stock background images from which to choose. The platform also gives bloggers the opportunity to monetize their content through Google AdSense. Site owners have complete insight into their audiences with an effective analytics suite. This lets bloggers know who they’re writing for and where their readers are from, and they can gauge what visitors are interested in. And, with storage provided by Google for free, you can house thousands of posts and multimedia content with the peace of mind you won’t lose them. With Jekyll, writers can turn their words into fully functional blogs that showcase their stories. Jekyll’s static site generator provides a template directory of raw text files and converts text through Markdown and its proprietary Liquid renderer into presentable websites. The platform’s quick start guide walks users through the installation process, which only takes minutes for those who are already employing a Ruby development environment. Even though Windows isn’t an officially supported platform for Jekyll, there is a cheat sheet offered on its site giving detailed instructions on how to run it on the OS by installing Bash on Ubuntu. The software is developer-friendly, but those with little or no coding knowledge may find it more complicated than the drag-and-drop environments other web builders provide. If you’re a developer, however, the templates make site development simple and offer vast customization options. Jekyll is free to use and is compatible with many hosts offering free hosting, including its partner GitHub. Most people who’ve browsed the internet have stumbled upon a Tumblr page. The blogging platform hosts more than 350 million blogs covering pretty much any topic you can think of. Tumblr is the social media platform of the blogging world, boasting more than 350 million blogs worldwide. Tumblr is kind of a mashup between a social media site and a blogging platform. Users can create their own blog pages and follow others. All of the blogs you follow and the comments readers make on them show up in your dashboard. It’s bloggers mingling with other bloggers. When it comes to setting up your page on Tumblr, a simple content entry system is available as well as a choice of styles and themes. Once you’re up and running, the platform gives the ability to post text, photos, quotes, links, audio, video, and even chat with other users. It’s free, easy to use, and a lot of fun. These are just a few of the drawbacks of opting for some of the free plans. But, for just a few dollars per month, bloggers can gain access to an array of features and site functionalities. We’ve traversed the web and found the best hosts offering premiere hosting packages at monthly rates similar to what a cup of coffee costs these days. The feature-rich packages provided by these hosts include everything a blogger needs to transmit their words to the masses. For some, that means one-click installations of platforms such as WordPress, Joomla, and Drupal, as well as the hardware and infrastructure needed for those content management systems to perform at top speed. One of the things that stands out with these hosts listed below are their dedication to providing top-notch hosting for WordPress. And, because of the WP platform’s popularity, odds are good most bloggers are already running with WordPress’s free software. Get started with InMotion now. While my family missed out on a free sailboat and wasted a few hours listening to a salesman pitch the benefits of spending time in mosquito-infested swamps, we learned to read the fine print to see just what “free” entailed. The free blog hosting offered by some of the platforms mentioned above are pretty straightforward. The benefits of the free packages are all written in black and white and the plans really are available at no cost. However, with the free plans come some limitations on storage, bandwidth, security, and marketing solutions, among others. That’s why serious bloggers may be better served by one of the “almost free” hosts. For just a few dollars per month, these hosts will help get your blog online and blast your words to the world.